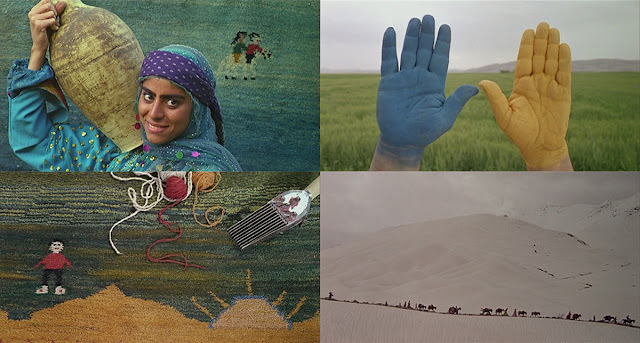 And what defines the first entry in Mohsen Makhmalbaf's Poetic Trilogy which also happens to be my first encounter with the said filmmaker and the first piece of cinema I watched in 2019 is also color. Labeled 'subversive' and banned in its home country of Iran, Gabbeh - a type of a Persian rug, as well as the name of the film's heroine (Shaghayeh Djodat in a brilliant debut) - plays out like an anthropological documentary alchemically transformed into a timeless folk fairy tale. Its simple, yet universal, highly lyrical and somewhat mysterious story is a rapturous ode to nature which celebrates desire and pays a loving homage to the art of storytelling itself. Intricately weaved just like the old couple's tightly knotted kilim on which the big-eyed beauty Gabbeh magically appears, it takes the viewer on an unpredictable and unforgettable journey across the breathtaking landscapes - verdant steppes, rocky mountains and sandy deserts. The (meta)tale of forbidden love which sees Gabbeh both as the narrator and (tragic?) protagonist twists time and expands or rather, explodes space, with the central theme skillfully and playfully re-shaped into abstract designs and arcane symbols. For Makhmalbaf, directing comes off as natural as breathing - in a way, he takes the perspective of a naïve artist and dips his brush into the sea water, sun-bathed skies and petals of poppy flowers in order to paint some of the brightest pictures ever to grace the screen. The stunning costumes of his nomadic characters (portrayed by non-professionals who imbue the film with a great sense of authenticity) create a kaleidoscopic patterns that pave the labyrinth corridors of Gabbeh's coarse, but warm three-dimensional tapestry. The most integral parts of Makhmalbaf's loom are Mahmoud Kalari's camera which wonderfully captures the imagery of Parajanov-like grandeur, and Hossein Alizadeh's ethereally melancholic score informed by traditional music.